This 33-day bicycle tour through southwest China begins in Chongqing, the port city on the Yangtze River, and ends in Kunming, the capital of Yunnan Province, known as the "Spring City" and home to China's largest concentration of ethnic minorities. The cycling on this tour is relatively strenuous. Average daily cycling mileage will be about 50 miles (80 km). Vehicle transport will be used on several days to supplement the cycling to get to the next destination. Riders will carry their own luggage in their bike panniers. This tour will visit both well-known and little-known sights and will appeal to those who have cultural, social and geographical interests. This tour begins with a tour of brief tour of Chongqing going for a ride on a cable car to get an aerial view of the city. Afterwards transportation will be used to get part way to Dazu before beginning to cycle to Dazu. The second day the tour will visit a number of Confucian, Taoist and Buddhist mountain grotto sculptures (as well as a Christian church) in the surrounding area. On the third day the group will cycle to Zigong, the location of a dinosaur museum and a working salt museum. On day 4 we will cycle west to Rongxian to visit China's second largest Buddha statue (193 ft, 58.7 m) followed by Leshan to visit the world's largest sitting Buddha statue (232 ft, 71 m). Next we cycle to Emei Mountain, one of China's five sacred Buddhist mountains for a night's stay at the summit. Using transportation part of the way we will then head north to Anren near Dayi, to visit the Li Landlord Manor. This was used as a re-education center to illustrate the evils of the landlord-serf system and includes an area of clay figures graphically displaying the downtrodden workers being abused by the landlord. Next will head west to Duijiangyan, a location of the 2,500 year old irrigation system that is still in use today. On day 10 we will take transport part way to the road leading into the Wolong Panda Nature Reserve. The next day, the group will head up to Balangshan Pass (partially using transport) through the Wolong Nature Reserve. The pass is at 4,550 meters (14,950 feet). The following day we will cycle (mostly downhill) to Xiaojin Xian where there is a Buddhist Temple, an Islamic Mosque and a Catholic Church where Mao spent some time on the Long March. 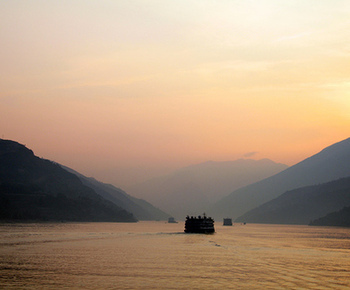 The next day we will cycle to Danba, located on the Dadu River, a major tributary to the Yangtze. Along the way we will visit a lamasery and a Tibetan Buddhist Temple. In Danba, the group will explore the area including some of the Tibetan Defensive towers the dot the hills around the town. From Danba we will head south along the Dadu (going downstream) to Luding. Next stop is in Moxi, the gateway to Hailuogou Glacier Park. We will continue along the Dadu River to Shimian. There will be overnight stops at the small towns of Shimian and Mianning before arriving at Xichang, the heart of the Yi minority. The route then turns west toward Yunnan stopping at the small towns of Pingchuan and Yanyuan before arriving at Lugu Lake. This is the center area of the matriarchal Mosu culture. The next stop is Lijiang, home of the Naxi minority and set in a valley overshadowed by Jade Dragon Snow Mountain. With a picturesque old town including fast moving water through open waterways and wooden architecture, Lijiang makes a good two-day stopover. The next segment of the tour goes into Tiger Leaping Gorge, a spectacular mountain area. This is one of the deepest and most dramatic gorges in the world and is still quite wild despite the enormous efforts to tame it. Heading south will we cycle along side the Yangtze River and view the First Bend (where the river makes a U-turn and heads north) on the way to the east China emptying into the South China Sea. Next the group will head to Jianchuan cycling along the old Dali-Lijiang road where numerous minorities can be seen along the road in traditional dress. In Jianchuan we will have an opportunity to visit the Jinhuashan Precipice Bas-relief Grottos. The next stop is Old Dali which still has some of that small town charm and is ideally located between the Cangshan Mountains and Erhai Lake. On the following day we will visit the Three Pagodas and Chongsheng. We will then fly to Kunming, the capital of Yunnan Province known as the "Spring City" and our final destination. We will visit the Yuantong Temple, Cuihu (Green Lake) Park and the East/West Pagodas. 2. All hotel accommodations for 32 nights. 4. All group transportation costs (buses and trucks and flight from Dali to Kunming). 5. All group entrance fees. This will be a self-supported ride. This means that each person will carry their own luggage while cycling. Vehicle transportation will be used when necessary. If you decide to do something on your own, you will be responsible for those costs.